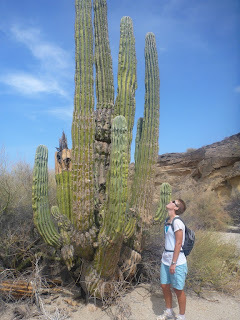 When we left Santa Rosalia, we headed eighty miles north to San Francisquito. The first day of the trip consisted of calm winds so we motored all the way to Punta Trinidad (about half way). During this leg of the trip we had more fishing action than the rest of our 5 months combined. Someone had thrown the "switch" we had been hearing about to start the good fishing season apparently. 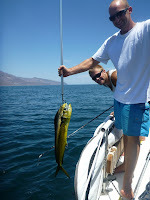 We caught a 32" Dorado, which was quite exciting to real in compared to our previous skip jacks. Somehow Anne-Marie convinced me that we should put the lures back in, since we could handle one more fish. Despite my better judgement I agreed and we reset the reel and hand line. Thirty minutes later we had two more Dorado on the line simultaneously! One on the reel and one on the hand line. Catching two at the same time hadn't even occurred to me, since our usual problem was never catching anything! The Dorado on the hand line was even bigger, at 36"! Clay pulled it in with ease on the 200lb test hand line. The one on the reel was another story. It was whipping the line off the reel even at maximum resistance. It took all we had to make any progress against it. "Luckily", it solved our problem of too much fish by breaking the line and escaping. It must of been massive, as novice fishermen we should have let it get more exhausted before reeling it in so aggressively... you live you learn you loose lures. From Punta Trinidad to San Francisquito was uneventful, and we enjoyed a couple days there waiting for a weather window to cross the Sea of Cortez (approximately 80 miles). There are a lot of thunder storms this time of year on the mainland side, and it is best to avoid them while crossing. One day we got up at midnight to inspect the thunder bumper situation, that is what Geary the local weather man calls thunder storms, and it looked relatively calm. We took off into the night at about 1:30AM and had a 16 hour crossing to the mainland. The weather forecast was a bit off unfortunately, and we ended up pounding into the waves all the way there on a close haul (30 degrees off the wind), as opposed to the more comfortable close reach (45-50 degrees off the wind) which was forecast. The poor weather forecast may have actually been to our benefit though, as we may not have visited some really amazing anchorages north of San Carlos if the wind hadn't blown us more north. Most of the people we have spoken to during our time cruising have told us that there is not much happening on the mainland side of the Sea of Cortez (from Mazatlan north). Which is certainly true when one just looks at the number of anchorages on the mainland side of the Sea of Cortez, but the two anchorages we visited were right up there with the best the Baja peninsula has to offer. The anchorages we went to were Las Cocinas, and San Pedro. Both had the best water visibility we had seen in the Sea of Cortez so far, and had beautiful red rock formations along the shore. We look forward to sharing this area with Anne-Marie's parents when they come to visit in October. Right now we are in San Carlos doing boat projects and preparing to put Starship to bed for the summer. We are getting out just in time (perhaps a little too late! ), as the heat is getting excruciating. 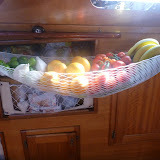 Even the simplest of boat projects results in sweat streaming off your body. The other day I was just unscrewing our SSB (4 screws), and I was soaked in sweat! That was at 7:30AM... we took the rest of the day off. We look forward to spending a couple of months back in Canada visiting family and friends. That way we will miss the worst of the hurricane season, and the best of summer/fall in Canada. In mid October the journey will continue, as we explore the Pacific coast of mexico (Puerto Vallarta, Zihuatanejo, etc...) before jumping the puddle.